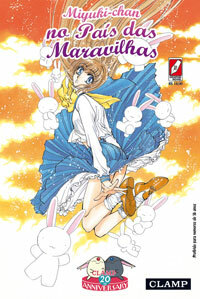 JBC announced that they will be publishing CLAMP’s Miyuki-chan in Wonderland! The Brazilian version will be released in a 13,5 x 20,5 cm format and will come with the original 24 colored pages, for the price of R$ 14,90. The release date is scheduled for May 28. The manga will be the first CLAMP title to be published under the JBC Graphic Novel label. This is the 9th CLAMP title to be published in Brazil, no other manga artist has had as many works published in Brazil as CLAMP. Very very happy with this news =) I wasn’t expecting new CLAMP releases while Tsubasa and XXXHOLiC were still being published. That’s really great news (3 CLAMP titles released in the same month, wow!). This new label for Graphic Novels opens the possibility of publishing CLOVER the way it deserves to be published, I hope?